When it comes to condominiums in Toronto, advanced technology — or at least wiring to prepare for upcoming new apps and services that eat up bandwidth — is becoming a standard amenity. "Fortunately, we have entrepreneurial service providers who have created ways to handle the ongoing demand for more tech capabilities. For example, Beanfield Condoconnect is a Toronto-based telecommunications company servicing the Intelligent Community Network Connection for Waterfront Toronto. This is Canada’s first open-access ultra-high speed broadband community network. Beanfield is providing service that is usually four times faster than typical residential networks — the fastest in the country. Residents of condominiums such as Great Gulf’s Monde will enjoy 100 MB upload and download speed through this network, with every suite at Monde being broadband ready. Dundee Kilmer’s Canary Park community is also part of Toronto’s waterfront Intelligent Community, with fibre optic cabling to each suite, free WiFi throughout the master-planned neighbourhood and in-suite wiring in specific areas for unlimited capacity ultra-high speed Internet. At Chaz Yorkville in the Bloor-Yonge neighbourhood, developer 45 Charles Ltd. and project manager Edenshaw Developments Ltd. have partnered with Rogers Communications and Beanfield Technologies to provide wireless, Internet and TV services, making the condominium a leading-edge building with regard to online connectivity. In addition, Chaz Yorkville offers a web portal community-building platform called Bazinga! From their tablets, computers or mobile devices, people can access a wealth of information about the condo, actually book an elevator for a delivery or the party room for an event. 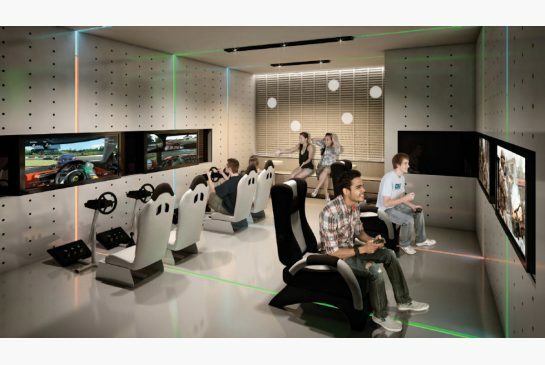 Suite owners also love Chaz Yorkville’s competition-grade Gamers Arena and two state-of-the-art theatre rooms that provide 4K screen resolution. At The Rosedale on Bloor, residents will receive Rogers Ignite 250 Unlimited Internet installed in the suites. Download speeds will range up to 250 Mbps; and Internet usage will be unlimited; and unlimited WiFi will be available in all of the condo’s amenity areas. The pace at which today’s technology advances is both dizzying and exciting, and manufacturers are rising to the challenge to satisfy our need for wanting everything FAST and at our fingertips. There are wireless audio products that allow you to control the music and audio in your suite using your iPad. We’re also seeing electronics that enable homeowners to control things like heating, lighting and even opening and closing blinds remotely. Future-proofing condominium parking spaces for electric cars is also becoming common, as developers anticipate the upcoming needs and wants of buyers."